Peacefully on Friday, October 12, 2018, in her 97th year, in Ottawa. 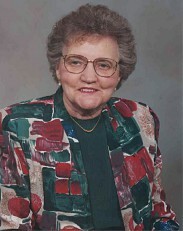 Beloved wife of the late John White. Lois will be greatly missed by sons Gary (Claire) and Bill (Romaine). Predeceased by sons Jim and Alan. Grandma will be missed by grandchildren Neil, David, and Sophia. Lois was predeceased by twin brother Lorne, sisters Frances MacDonald and Marie McGill, and brother Lyle. She is survived by her sisters-in-law Amy Honey and Audrey White, and her nieces and nephews. Our sincere thanks to the staff at Longfields Manor for their kindness and care of Lois over the past several years. Funeral service will be held at the MacCoubrey Funeral Home 11 King Street West, Colborne on Saturday, October 20, 2018 at 1:00 p.m. Memorial donations to Rothwell United Church, Ottawa, or Heritage United Church, Colborne, or a charity of your choice would be welcomed. Condolences received at www.MacCoubrey.com. Saturday October 20, 2018 at 1 p.m.